When most of us want to buy a first-person-shooter, we look for a game with the latest graphics, reliable team play, and maybe an interesting plot line if we're lucky. 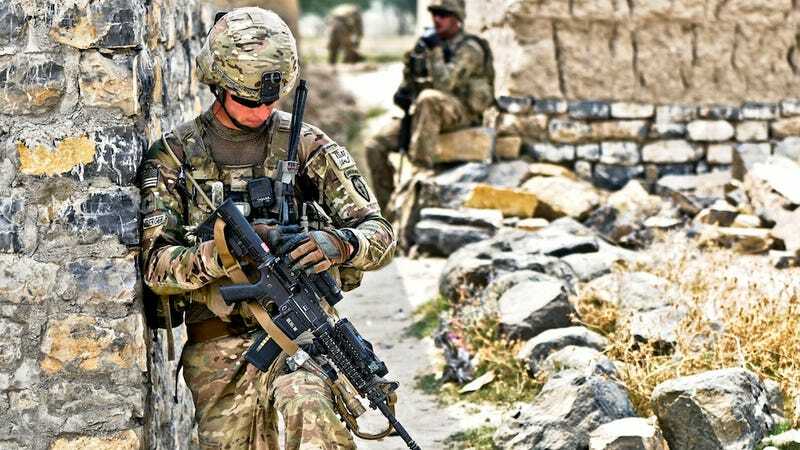 But when the U.S. Army wants an FPS, it likes a few extras, like the ability to call in artillery fire, medevac missions, or authentically depicted Arab and Afghan female suicide bombers. By 2013, the Army would like a new FPS with those features and more. The new game will replace Bohemia Interactive's Virtual Battlespace 2 as the flagship game in its Games for Training program. It says something about the nature of 21st Century military technology when Air Force pilots are flying the same 50-year-old B-52s that their fathers flew, yet after only four years, the Army already needs a new shooter game. The Army wants a design that incorporates the latest graphics and game technology, and so last month, the Program Executive Office for Simulation, Training and Instrumentation (PEO STRI)—the Orlando-based organization that procures Army training gear—published a draft Request for Proposal to solicit input from the game industry on what they can offer. PEO STRI put together a handy 243-page technical requirements document and a 13-page checklist on what a next-generation Army shooter should look like. After a decade of fighting two wars, the Pentagon isn't salivating at the prospect of doing more counterinsurgency, but the new shooter game suggests that the Army is girding for it anyway. The tech minimum requirements are mixed: a Core 2 Duo processor with 4GB of RAM on the low end, or an i7 processor with 16GB of RAM. But what's interesting isn't how different real military games are from their ostensibly brain-dead entertainment counterparts, but how similar they are. Most of PEO STRI's requirements consist of long, long lists of specific equipment and terrain that need to be included. The hardware, from M-1 to Russian T-72 tanks and Apache helicopters to Predator drones, wouldn't be out of place in a modern warfare shooter like Battlefield 3. Also notable is how explicitly oriented the new Army shooter is toward fighting "small wars". The Army wants a game that includes more than 50 types and models of civilian vehicles, from Taliban-endorsed Toyota Hilux pickup trucks to bicycles, more than 100 civilian structures from factories and mosques to trash piles, and traffic control gear such as spike strips and speed bumps. After a decade of fighting two wars, the Pentagon isn't salivating at the prospect of doing more counterinsurgency, but the new shooter game suggests that the Army is girding for it anyway. Bohemia Interactive is likely to bid on the Army contract, as is America's Army 3, which lost to VBS2 during the last—and controversial—selection process. The contract isn't large by Pentagon standards—only $44.5 million over five years. But even if the money isn't huge, the winning contractor will enjoy the cachet of publishing a game that will have a prominent role in military training around the world. Not only is VBS2 also used by the U.S. Marine Corps, Special Operations Command (SOCOM), Britain, Canada, Australia, and various NATO nations, but the Army has turned it into a jack-of-all-trades trainer for everything from cultural awareness to IED detection. The Army's new shooter game will be used for a lot more than shooting. Let's build a game. Let's make it a strategy game. We will realistically simulate global politics in the 2030s. Perhaps a sort of Civ or Supreme Ruler 2020-type system. Invade Syria? A Video Game Tested That.